The four-engined Lancaster bomber, which entered service with the RAF in 1942, is one of the most iconic British aircraft of the Second World War and is still flying, seventy years on. 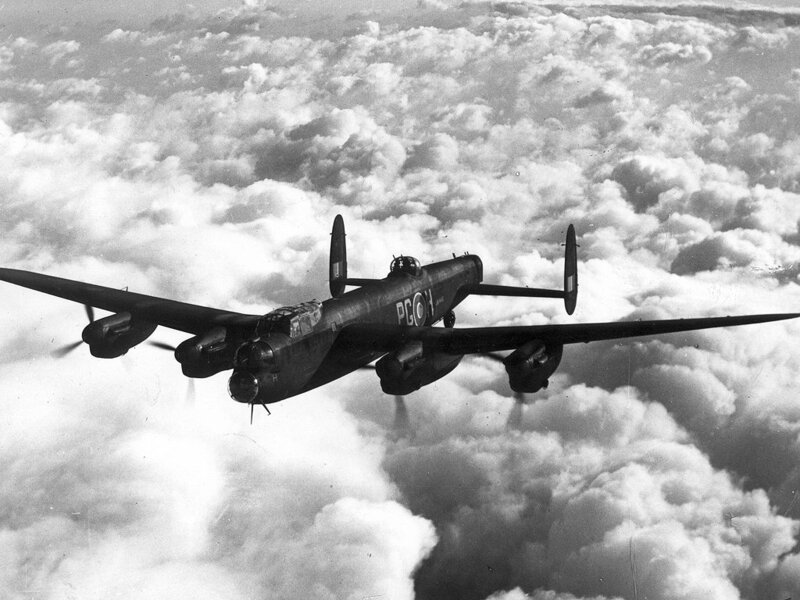 The aircraft made its first operational bombing mission on 17 April 1942 and by the height of the war 42 Bomber Command squadrons operated Lancasters. 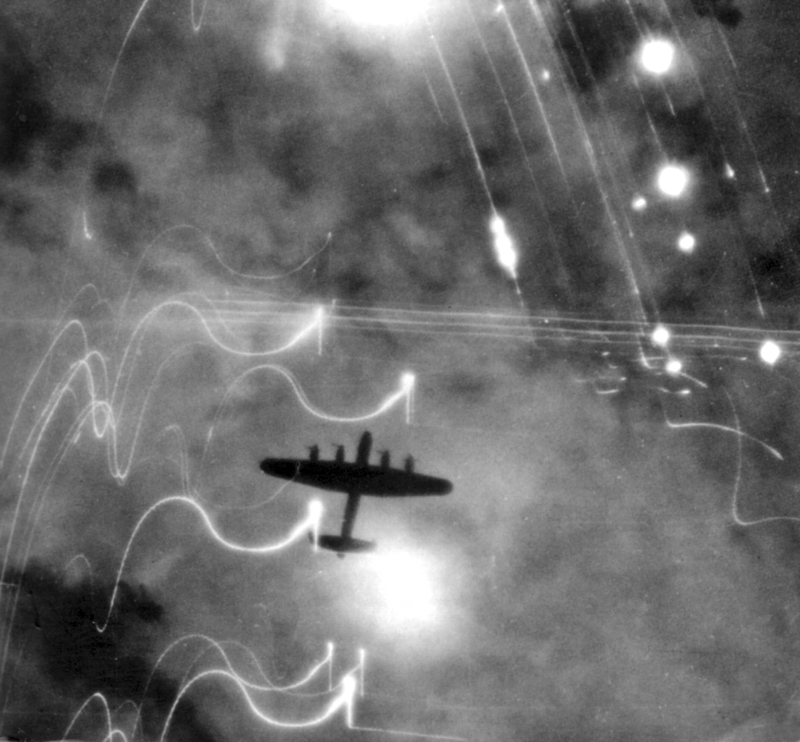 It was the mainstay of Bomber Command and the one aircraft, above all others, that did more to take the fight to the enemy in the skies over occupied-Europe during those dark days of the war. The first Lancasters into the air were six aircraft led by Squadron Leader John Nettleton from 44 Squadron that took-off at 3.12 pm and were joined by a further six aircraft from 97 Squadron. The Lancasters faced unprecedented anti-aircraft fire and were soon pounced upon by German fighters, including the fighter ace Major Walter Oesau, who had 100 victories to his name and who had been forbidden to fly again by the Luftwaffe. Of the twelve Lancasters that set out only five returned home and forty-nine of the eighty-five aircrew were missing. Nettleton’s Lancaster, R5508, was the last to return and landed at Squire’s Gate near Blackpool in the early hours of the following morning. Ten days later on 28 April 1942 the London Gazette reported that Nettleton had been awarded the Victoria Cross and the other surviving aircrew had been awarded Distinguished Flying Crosses (DFC), Distinguished Flying Medals (DFM) and a Distinguished Service Order (DSO). In all, the Lancaster took part in 156,192 missions and dropped 608,612 tons of bombs before the end of the Second World War. Of the 7,374 aircraft produced a total of 3,431 were lost in action and 246 were destroyed in operational accidents. Only 35 managed to complete 100 operations; the most successful managed an astonishing 139 missions. Today there are only two flying Lancasters left in the world. Lancaster BI PA474 City of Lincoln is operated by the Royal Air Force’s Battle of Britain Memorial Flight and can be seen at numerous air displays around the UK each year. The second is BX FM213, an ex-RCAF aircraft, which underwent a ten-year restoration programme and is operated by the Canadian Warplane Heritage Museum at Hamilton International Airport, Ontario.